A group claiming to have ties to ISIS has threatened Twitter employees and the company's founder, Jack Dorsey. Self-identified ISIS supporters have made online threats against Twitter founder Jack Dorsey and other Twitter employees for shutting down accounts that promote ISIS. In a post on anonymous forum justpaste.it, the group drew an illustration of Dorsey in crosshairs. The Arabic message that follows contains several death threats. 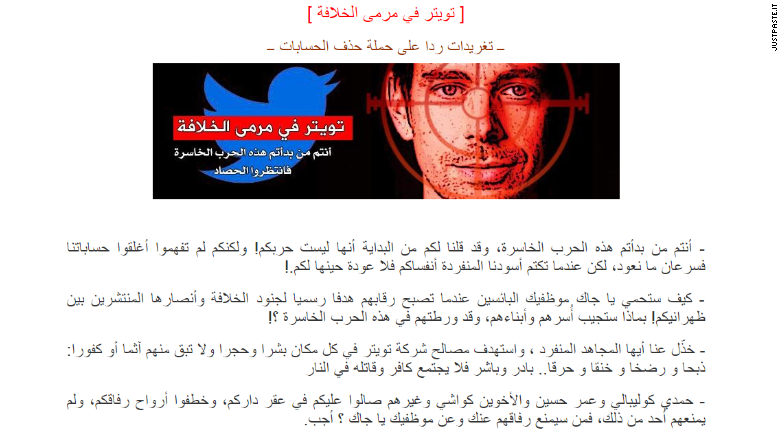 Claiming that Dorsey and Twitter have started a "war" against the Islamic State, the group said the "necks" of Twitter employees have "become an official target to ISIS soldiers and supporters." Twitter's terms of service forbid hate speech, threats and posts that promote terrorism. The social media site has actively tried to take down accounts tied to ISIS, particularly after Anonymous hacktivists took it upon themselves to block access to terrorist websites and social media profiles. In its post, the group said it would "silence Dorsey's breath." Twitter (TWTR) said it is working to confirm whether the threats are serious. "Our security team is investigating the veracity of these threats with relevant law enforcement officials," a spokesman for Twitter said.